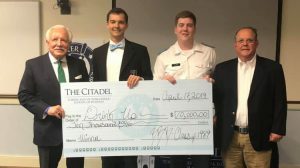 Some political science cadets and graduate students at The Citadel have a new perspective on the potential impacts of diplomatic efforts related to the global tension surrounding North Korea’s nuclear weapons tests. They understand more about the challenges involved with multilateral negotiations where this issue is concerned after a simulation led by the Director of Academic Affairs and Research for the Korea Economic Institute of America (KEI). In late September, KEI’s Kyle Ferrier, delivered a simulation of the Six-Party Talks related to North Korea’s nuclear weapons program. 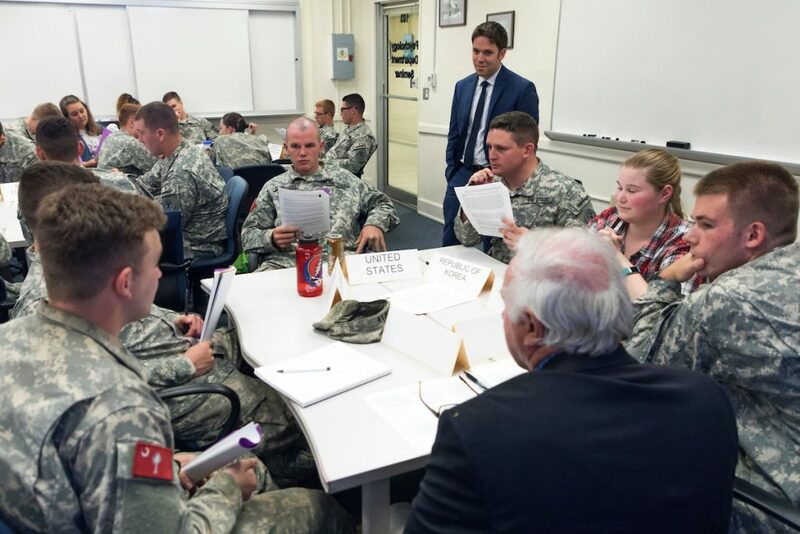 As part of the simulation, graduate students in the master’s program in international politics and military affairs (IPMA) worked with undergraduate political science majors to recreate these talks. The Six Party Talks, which began in 2003, included the United States; the People’s Republic of China (PRC); the Republic of Korea (ROK or South Korea); the Russian Federation; Japan; and the Democratic People’s Republic of Korea (DPRK or North Korea). The talks were initiated with the goal of using diplomacy to resolve threats stemming from the North Korean nuclear weapons program. Some global leaders are calling for a return to the talks while others say it wouldn’t work. “KEI is a Washington, D.C.-based think tank dedicated to promoting dialogue and understanding between South Korea and the United States on economic, political, and security relations. 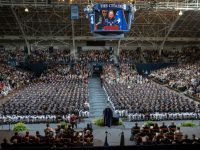 As part of this effort representatives travel across the U.S. to engage with various audiences on subjects of current importance to U.S. – South Korean relations,” said Sarah Tenney, Ph.D., a professor of political science at The Citadel. “The knowledge gained from this exercise is considerable.” Tenney arranged for KEI to provide the simulation for The Citadel students. As Ferrier led the simulation, he divided students into teams of six. Each student served as a lead negotiator for one of the six countries. As government representatives, students were tasked to reach a comprehensive agreement for North Korea’s denuclearization. With private information, resources, and their own intellect, the student negotiators set out to win the best outcome for their respective governments. Participants learned about issues surrounding diplomatic engagement with North Korea and the difficulties of international negotiation. 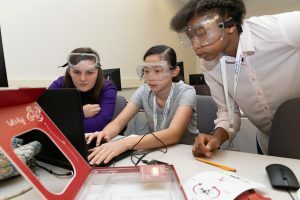 “Having done considerable research myself on the North Korean nuclear issues, I was amazed at the background knowledge the cadets in the simulation displayed. 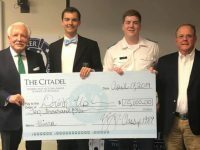 They played their roles with detailed arguments and appropriate diplomacy,” said Thomas Dewey Wise, an international politics and military affairs student with The Citadel Graduate College. The hands-on approach of the simulation provided an enhanced understanding of the security situation on the Korean peninsula. “I find that students enjoy role play exercises more than traditional lecture. 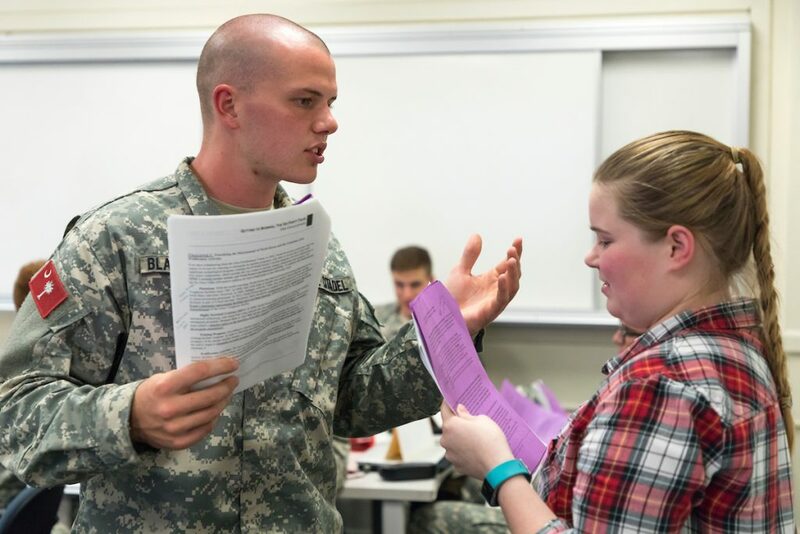 It helps us gain a much deeper and more lasting understanding of the issues covered, and the Six Party Talks simulation is a great example of this,” said Cadet Hunter Besancon, a junior political science major from Greenville, South Carolina. To date, more than 4,600 students have participated in the simulation, including cadets from West Point and the Air Force Academy. 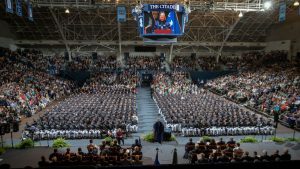 “Some of our Citadel cadets who earn commissions and will become military officers when they graduate, may find themselves in South Korea in the near future. 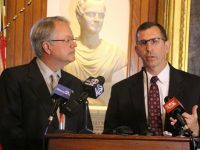 Now they’ll arrive with a solid understanding of the issues,” Wise said. Ferrier manages KEI’s outreach efforts to foster collaboration between the academic and policy communities. Prior to taking his position with KEI, he held positions the U.S. Department of State and the Bank of New York Mellon. Ferrier was also a Fulbright English teaching assistant in South Korea, for middle school students in Naju. During his time in Korea, he led students in a U.S. embassy-sponsored youth diplomacy program in Seoul and volunteered with North Korean escapees. Wise plans to supplement his research and writing about the North Korean nuclear program with information gleaned from the simulation with the goal of publishing the paper while still a Citadel graduate student.